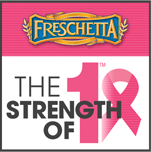 October is National Breast Cancer Awareness Month and the Freschetta® pizza team are spreading awareness through their new campaign - The Strength of 1™. Their mission is to inspire everyone to realize that one person - any one - can make a difference in this fight against breast cancer. The campaign sponsors Bright Pink, the only national non-profit organization whose focus is on the prevention and early detection of breast and ovarian cancer in young women, while providing support to high-risk individuals. Now through the end of October 2012, you have the chance to help Freschetta® make a difference in the fight against breast cancer. Ways to help: Checkout the The Strength of 1™ app on Freschetta's Facebook page here. There you have access to hare your story, take the pledge, Tweet about it and more. When you make your pledge, you will be given the opportunity to print a $1 off coupon!! Also be sure to purchase the specially marked Freschetta® pizza's, they are donating $25,000 to Bright Pink! You can can also support The Strength of 1™ Thunderclap. To do so, visit their page on thunderclap here. Click on the “Support with Twitter” or “Support with Facebook” button to help further spread the word about this The Strength of 1™ mission.